This was once the site of Bethany Christian Church and a public school that included a teachers' dorm. The Fannie Harrington Methodist Chapel was across Custer Road. For many years the church supported Add Ran College, which is now known as Texas Christian University. This was the start of the First Christian Church in Plano. There are 2 brick pillars at the entrance. One says, "Bethany Christian Church and Public School, 1877." The other says, "Bethany Cemetery 1877, endowed by the estates of Roy and Russell Carpenter." The cemetery covers about 2 acres of land. The northern ½ has graves. The southern ½ is empty. It is fenced and very well maintained. It is still active. In 1877 W. N. Bush deeded the elders of the Bethany Christian Church 4 acres of land to be used as a cemetery. The deed for the cemetery is listed in Vol 4, p 430. A large portion of the graves are for the Carpenter family. It is referred to as the Carpenter Cemetery by some people. Capt. R. W. Carpenter was in the Civil War. He said that when he died he wanted to be buried wrapped in the Confederate flag. He is buried in the cemetery. 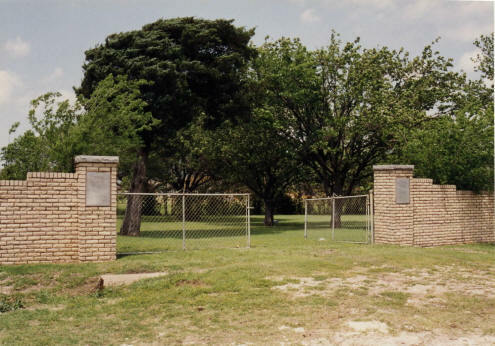 The cemetery is near the site of the old North Dallas Airport. The airport no longer exists but it is on some maps. Mapsco incorrectly calls this cemetery "Rowlett." The Rowlett Creek Cemetery is about 3 miles north. At one time Bethany Road in Allen probably came through to this area.